Mega Blastoise in game: 281 Who? Important notice! Pokemon Mega Blastoise is a fictional character of humans. 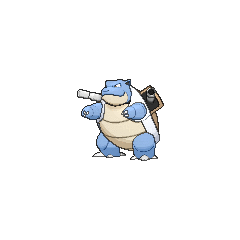 Blastoise (Japanese: ????? Kamex) is a Water-type Pokémon introduced in Generation I.
Blastoise is a large, bipedal tortoise-like Pokémon. Its body is dark blue and is mostly hidden by its tough, brown shell. This shell has a pale yellow underside and a white ridge encircling its arms and separating the upper and lower halves. Two powerful water cannons reside in the top sides of its shell. These cannons can be extended or withdrawn and can be used to assist in high-speed charges. 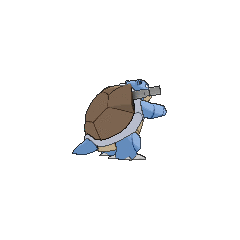 Blastoise's head has triangular ears that are black on the inside, small brown eyes, and a cream-colored lower jaw. Its arms are thick and striated with three claws on each hand. Its feet have three claws on the front and one on the back. It has a stubby tail. As Mega Blastoise, it develops two smaller shells over its arms, each with their own water cannon. The two cannons on its back are replaced by a single, central water cannon of greater size. 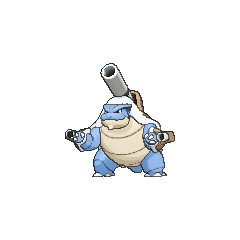 This cannon extends forward over Mega Blastoise's head and is said to have a blast range of over 6 miles (10 km). Small ridges develop over its, now red, eyes and extend to its ears. The ears angle slightly backward and there is a small point on its chin. 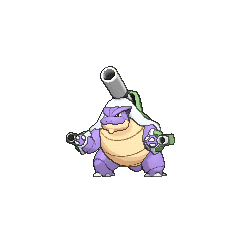 The powerful cannons on this Pokémon's back are capable of producing water blasts that can pierce steel and concrete. 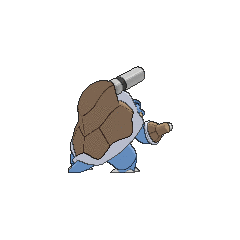 Blastoise deliberately makes itself heavy to withstand these powerful blasts, and it will crush its opponents with its bulk. It has two former signature moves, Skull Bash and Hydro Cannon. The anime has shown that Blastoise can take the role of a leader in large groups of Squirtle and Wartortle. Its preferred habitat seems to be freshwater ponds and lakes. Gary has a Blastoise that he received as a Squirtle from Professor Oak. 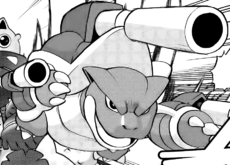 Tierno has a Blastoise that he received as a Squirtle from Professor Sycamore. In Beach Blank-Out Blastoise a Blastoise that was ruling over an island of Squirtle and Wartortle had a Jigglypuff stuck in one its cannons and its song made everyone fall asleep. Neesha, a Trainer who went to New Island in Mewtwo Strikes Back, had a Blastoise named "Shellshocker". It fought with Mewtwo's cloned Blastoise and lost. It was taken away from her by one of Mewtwo's special Poké Balls but was liberated by Ash along with the other confiscated Pokémon. Along with Ash's Charizard and another Trainer's Venusaur, they were the only confiscated Pokémon not to be cloned: this could be because Mewtwo didn't need more than one copy of each Pokémon and it already had their clones. Cissy used a Blastoise against Ash and his Lapras in a Wave Race for the Coral-Eye Badge during Fit to be Tide. It reappeared in flashbacks of A Way Off Day Off, Hello, Pummelo! and Viva Las Lapras. A Blastoise was one of the Pokémon competing in the Pokémon Sumo Wrestling in Ring Masters. It went up against Raiden's Feraligatr and lost. During One Trick Phony!, Jessie used a Blastoise borrowed from Battle Park against Ash's Pikachu in an elaborate plan to capture it. Lola has a Blastoise which she used to rescue Flint's Golem after it had fallen into water in A Family That Battles Together Stays Together!. Sid has a Blastoise in Destiny Deoxys. Jimmy's Wartortle evolved into Blastoise in Judgment Day!. In Pokémon Ranger and the Kidnapped Riolu! Part Two, Kellyn had three Blastoise use Rain Dance in order to douse a forest fire that was caused by J's Salamence. A Blastoise and its Mega Evolution appeared in Mega Evolution Special I under the ownership of Siebold. 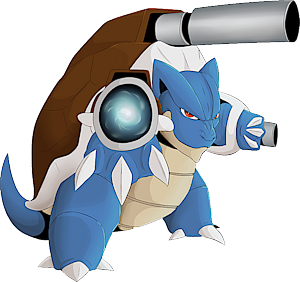 Blastoise first appeared as a giant mechanical Pokémon in Island of the Giant Pokémon. The first time a real Blastoise appeared in was in Primeape Goes Bananas. It was in Ash's flashback in an advertisement for the contest in which he won his special hat. 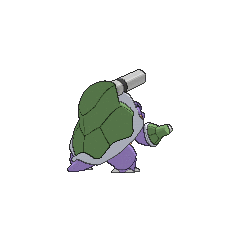 Blastoise also appeared in The Power of One. A Blastoise belonging to an unnamed Trainer, appeared in a Hall of Fame photograph in Hello, Pummelo!. A Blastoise under the ownership of a Coordinator appeared in Spontaneous Combusken! competing in the Chrysanthemum Contest. 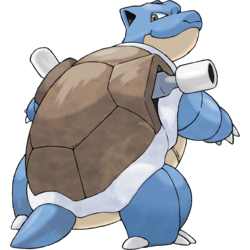 Blue owns a Blastoise, which appeared in The Challenger. He used it during his Pokémon League battle against Lance and his Dragonite, where it eventually won, allowing Blue to become Champion. 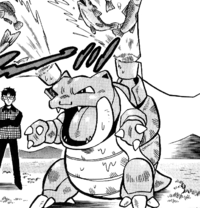 In Pokémon Adventures, one of Green's main Pokémon is a Blastoise nicknamed Blasty, which evolved from Wartortle prior to Zap! Zap! Zapdos! which evolved from the Squirtle she stole from Professor Oak. In Pokémon Stadium 2, there is a Trainer in the eighth battle of Poké Cup Ultra Ball R-2 who has a Blastoise with both Haze and Mirror Coat. However, it is impossible to breed both of these moves on the same Blastoise until Generation VI. 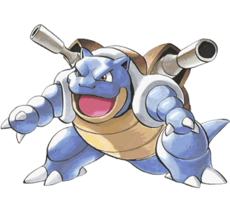 Blastoise's name is a combination of blast (referring to its cannons) and tortoise. Kamex comes from the Japanese word ? kame (tortoise/turtle) and possibly ???? max (maximum). Cantonese Chinese ??? Séuijingwai "Water rocket turtle"
Mandarin Chinese ??? / ??? Shuijiàngui "Water rocket turtle"